The other day when I was making this chocolate oatmeal bars, it suddenly struck me that I have never made or even thought of making chocolate raisins at home. Once that idea had taken seed, I was not able to dislodge it. 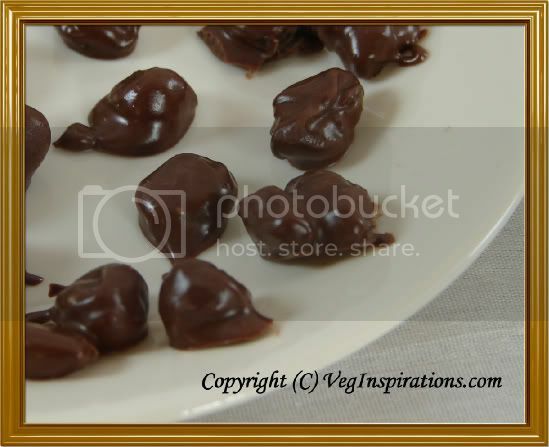 Deciding to indulge a little, I made chocolate covered raisins at home and used this recipe as a reference. Line a tray with parchment paper and keep aside. Pour oil on it and place in the microwave. Microwave it @ 40 percent power for 2 minutes. Remove, stir well and place again in the microwave. Microwave @ 40 percent power for another 2 minutes and 30 seconds and or until the chocolate has completely melted stirring every 30 seconds to a minute to make sure the chocolate does not get overheated. 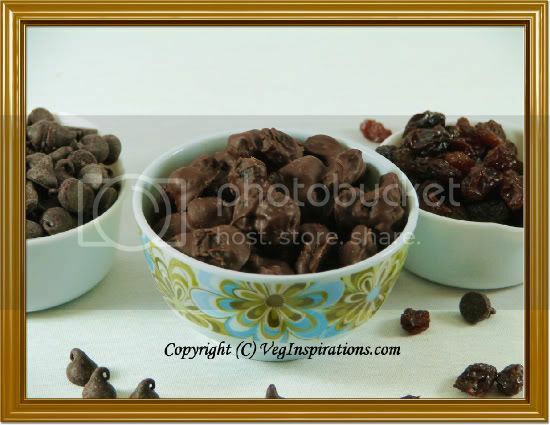 Stir the melted chocolate well, then add plump dark raisins and mix until all the raisins are coated with chocolate. Spoon the chocolate covered raisins on the parchment lined tray making sure that there are no big clumps. Freeze this for about 10 minutes or so. Remove, store in an airtight container and enjoy. Refrigerate the balance if any if you plan to store for a longer time.